OAKLAND, Calif. -- Marcus Semien singled into an empty center field with one out in the 11th inning, beating Los Angeles' five-man infield to lift the Oakland Athletics over the Angels 6-5 on opening day Thursday. Boog Powell hit a one-out triple off Noe Ramirez (0-1) to start the winning rally. Matt Joyce was intentionally walked to bring up Semien, who delivered his first career game-ending RBI. The Angels got consecutive two-out singles from Martin Maldonado and Zack Cozart in the 11th off Chris Hatcher (1-0) but didn't capitalize. 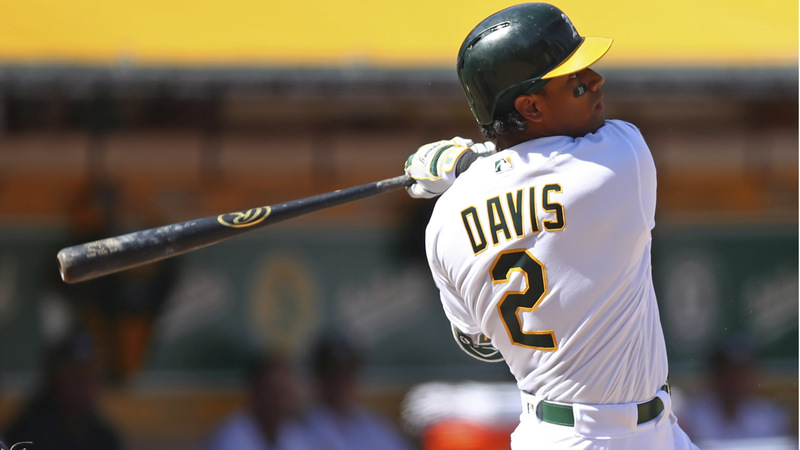 Khris Davis hit a three-run homer in the fifth and a tying single in the seventh to almost single-handedly get the A's back in it. Albert Pujols homered leading off the sixth, while Shohei Ohtani connected on the first pitch he saw for a single in a much-hyped major league debut for the Japanese two-way star. Kole Calhoun and Cozart also homered for the Angels to back Garrett Richards, who began this season healthy following two injury-shortened years. Richards left his initial 2017 outing on April 5 at Oakland, then didn't pitch again for the Angels until Sept. 5 because of a rare nerve irritation in his biceps. He missed most of 2016 with a torn ulnar collateral ligament. Batting eighth as designated hitter, Ohtani swung at the first pitch and grounded a hard single to right field off Kendall Graveman in the second inning. He grounded out his next three times up before a strikeout in the 11th. Ohtani often looked overmatched in the Cactus League, managing just four singles in 32 at-bats (.125) and striking out 10 times. The 23-year-old Ohtani is set to start on the mound for the first time in Sunday's series finale against the A's. Davis began his quest for a third straight 40-homer season, and Matt Olson tied the game at 4 with a solo shot moments later. Then Pujols chased Gravemen with a drive to left - No. 615 of his career - the slugger's fifth career homer on opening day. Graveman allowed five runs and seven hits in five innings with a strikeout and no walks in his second straight opening day start for Oakland. The A's played a day game home opener for the first time since 1994. The Angels, who opened at Oakland for a second straight year, lost their fifth straight season opener after winning the previous five. Click here for more stories about the Oakland Athletics.